FORGET KENYA. NEVER mind the secret madrassas. The sinister, shocking truth about Barack Obama’s past lies not in east Africa, but in outer space. As a young man in the early 1980s, Obama was part of a secret CIA project to explore Mars. The future president teleported there, along with the future head of Darpa. That’s the assertion, at least, of a pair of self-proclaimed time-traveling, universe-exploring government agents. Andrew D. Basiago and William Stillings insist that they once served as “chrononauts” at Darpa’s behest, traversing the boundaries of time and space. They swear: A youthful Barack Obama was one of them. Perhaps this all sounds fantastical, absurd, and more than a little nuts. We couldn’t agree more. That’s one of the reasons we love conspiracy theories — the more awesomely insane, the better. Each week during 2012, when the Mayans tell us to expect the apocalypse, Danger Room will peel back a new layer of crazy to expose those oh-so-cleverly hidden machinations powering this doomed plane of existence. According to Basiago and Stillings, Obama isn’t just lying about his identity. He’s lying about his military service record, too. While his political opponents in 2008 attacked him for never serving, in truth, he was concealing his participation in a hidden CIA intergalactic program hosted at a California community college in 1980. Obama wasn’t the only one making the otherworldly voyage. As “Barry Soetero,” the 19-year-old Obama was one of 10 youths selected to secretly teleport to and from Mars, forming a band of interplanetary Teen Titans. Regina Dugan, the director of Darpa, was another member. “Simply put, your task is to be seen and not eaten,” an elder chrononaut, retired Army Maj. Ed Dames, is alleged to have told a young Obama. You can scoff at the idea of Obama on Mars. But it explains a lot. Obviously the birth-certificate controversy is a side effect of Obama forgetting to sufficiently establish his fake identity as he learned to manipulate time and space. (Dugan has a demonstrated record of supporting space travel; the “jump room” must be broken.) And who else but a man accustomed to keeping the country’s most explosive secret would be comfortable waging so many undeclared wars? Ignore Basiago and Stillings at your own peril. 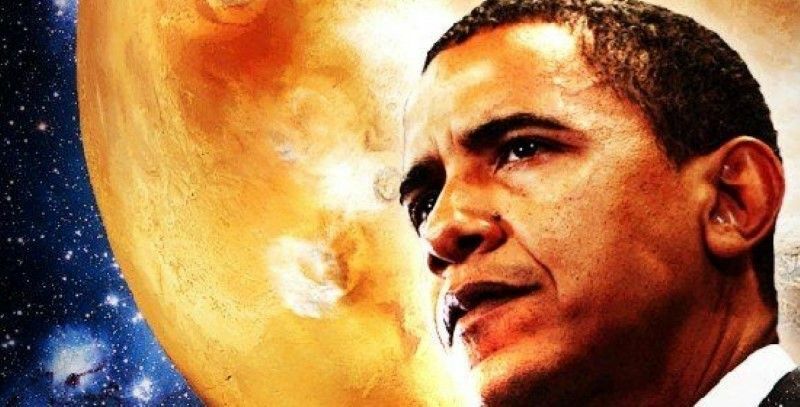 If Obama’s reelected, the U.S. is finally colonizing Mars. The Atacama desert Alien; What does science say?